A paper describing these results was published in a recent issue of the Monthly Notices of the Royal Astronomical Society and a preprint is available online. "The radio phoenix emerged when another cluster of galaxies slammed into the original cluster, sending shock waves through the system. These shock waves, similar to sonic booms produced by supersonic jets, passed through the dormant cloud of electrons. The shock waves compressed the cloud and re-energized the electrons, which caused the cloud to once again shine at radio frequencies." 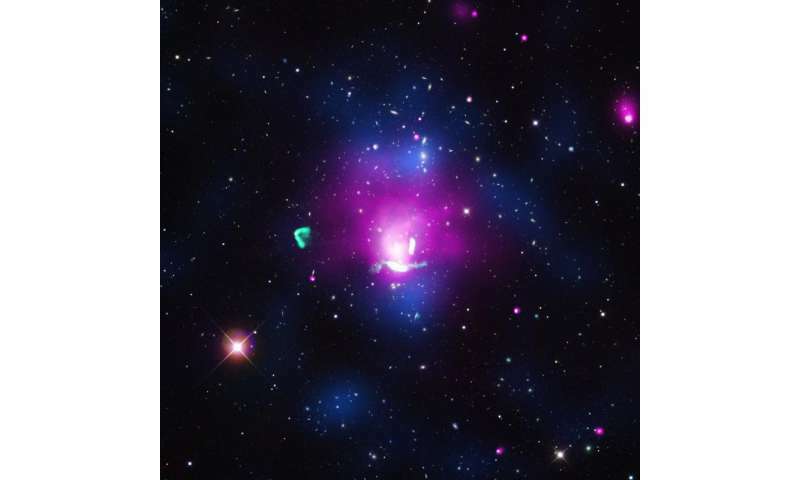 Galaxy clusters 'slamming' into one another? Really?? The writer of this is a graduate of the University of Hyperbole. Only a few tens of million years?